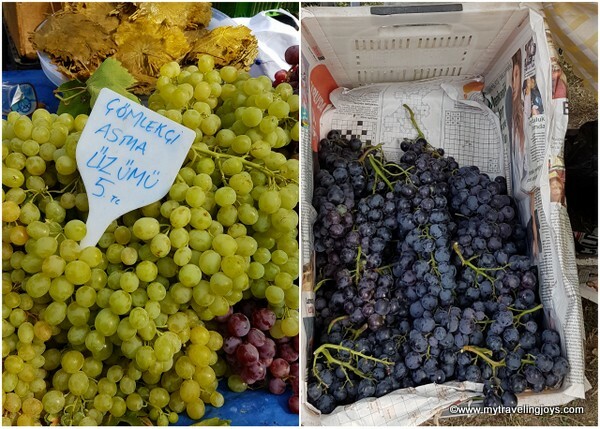 I can’t believe that it’s already been more than a month since I was in Bodrum, Turkey, for the 3rd Annual Karaova Grape Harvest Festival. 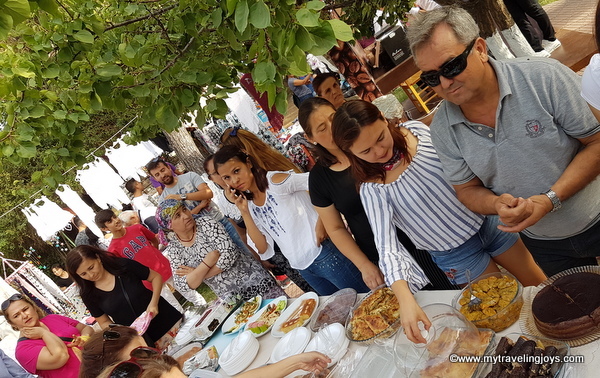 This fantastic foodie event, held in September in the Mumcular Park, highlighted not only the local crops of the surrounding rich agricultural lands, but also the local Turkish traditions and customs. 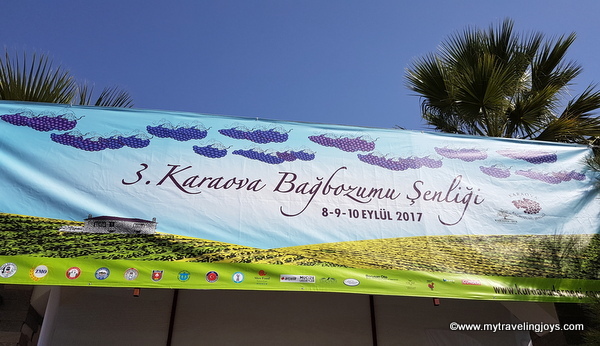 The three-day festival provided an excellent opportunity to learn more about these traditional ways and for me to spend some time basking in Turkish hospitality and supporting a wonderful cause. 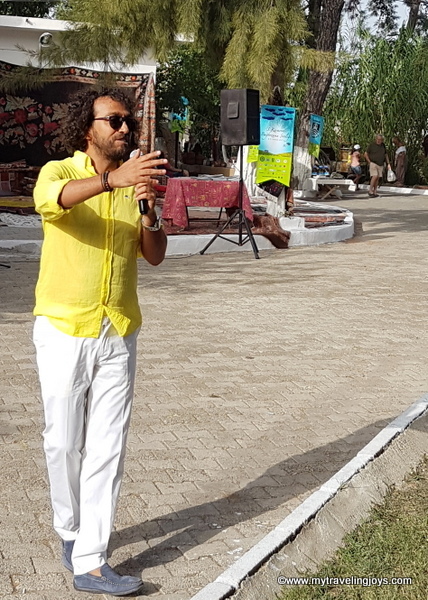 The event was organized by Karaova-Der, a local association under the leadership of Ali Öztürk, along with Slow Food Bodrum and the Bodrum municipality. 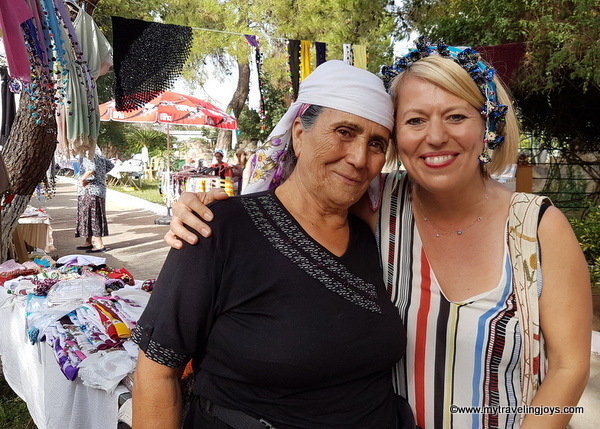 This week, I learned from fellow blogger Annie of Back to Bodrum that the event was considered a success, with a 30 percent increase in participants and visitors. That’s wonderful news! Since I come from a farm-based background and professionally work as a pastry chef, I am a firm believer in using local and seasonal products like the ones promoted at the festival. I was honored to be a guest chef at the event, helping judge the food contest and doing a cooking demo of my recipe for a Fig Tart with a Turkish Twist. Let me know if you give my recipe a go! 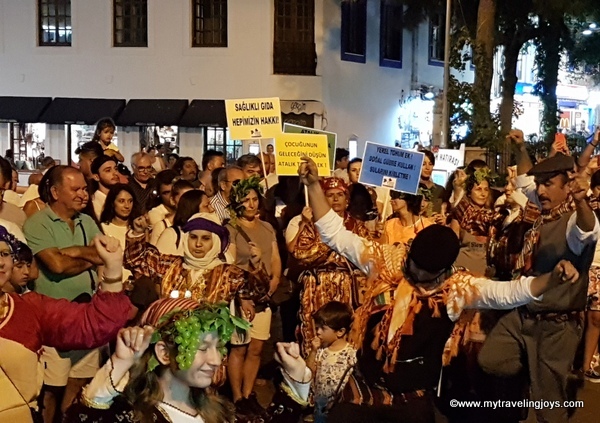 The festival kicked off on the first night with announcements by local officials and traditional Turkish dances held in the main Bodrum square or meydan. I loved the local dresses which are typical of the Aegean region in Turkey! On Saturday, I met up with a friendly group of Turkish bloggers and writers to spend a day at the festival. Although my Turkish has become a bit rusty these last few years, I still am able to communicate in my bir az Türkçe, and my yeni arkadaşlar were quite welcoming. 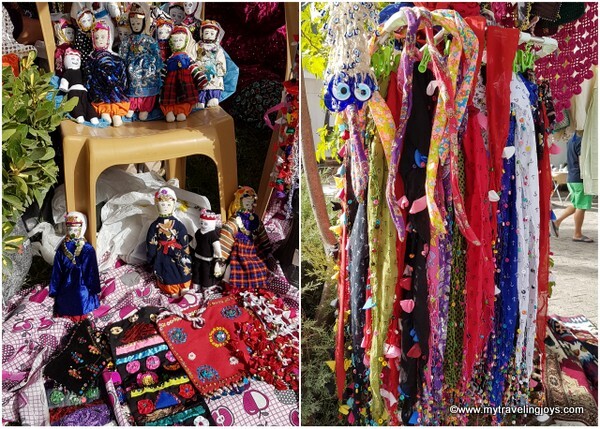 At the festival, I met several local farmers and women who make a living by selling their produce and spices or by making dolls, jams, compotes, sauces, scarves, placemats and tablecloths, wooden serving spoons and more. I had a wonderful time wandering around the festival, admiring and sampling various goodies by the numerous stallholders. I bought this beautiful blue scarf from this local lady who said the scarf matched by blue eyes. What a sweetie! 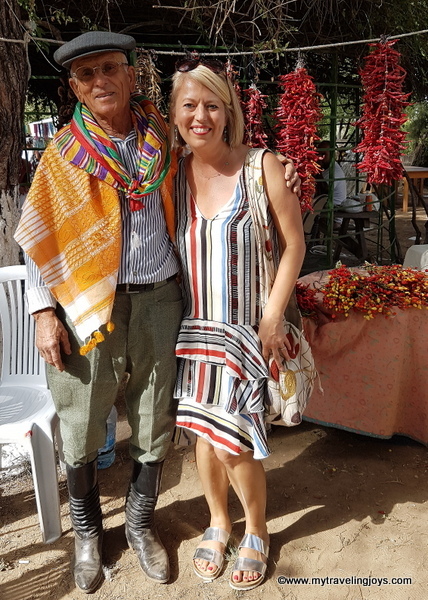 I couldn’t resist taking a photo with this local farmer! He was so jovial! I bought some spices and dried herbs from him. One of the bloggers, Suleyman Dilsiz of Istanbul did a presentation about cooking fish. He has published two cookbooks: “Kılçıksız Balık” (about fish) and “Kahvaltıya Dair Her Şey” (about breakfast). 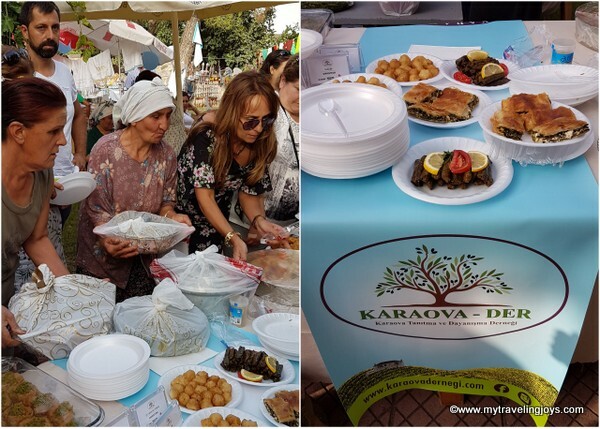 In the evening, I helped judge the food contest which included traditional Turkish recipes made by local cooks in three categories: Zeytinyağlılar (olive oil dishes), Tatlılar (desserts) and Börekler (savory pastries made from thin phyllo dough). The idea of the food contest was to help promote traditional recipes and to hopefully publish them all in a small booklet. I had no idea that judging a food contest would be somewhat difficult and filling at the end. Adding up all the proper points for each category took time. 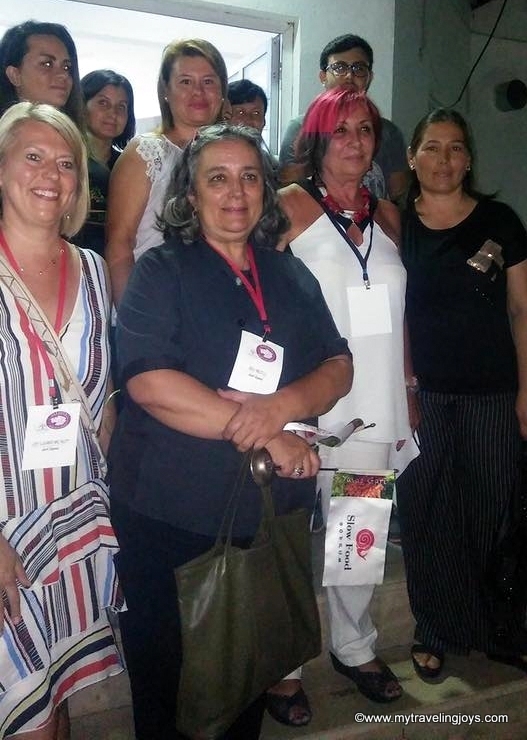 But I was very honored to participate along with Asli Mutlu of Cooking Classes Bodrum, Oya Emerk of Oya’s Cuisine in Istanbul, and two local residents. After we had counted the results, the winners posed for photos with Asli Mutlu, Oya Emerk and myself. What a wonderful event! 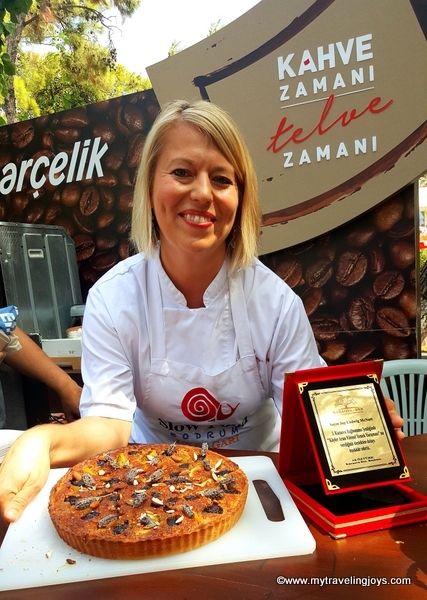 You can read more about the food contest and its winners written by Turkish blogger Arzu of Vanilins.com. On Sunday, I returned to festival because it was showtime! Even though I’ve given dozens and dozens of cooking classes over the years, I was still a bit nervous because I was talking in front of a mainly Turkish-speaking crowd. No need to fear! One of the volunteers from Slow Food Bodrum helped translate as I spoke in English. I felt more relaxed as I talked about one of my favorite tart recipes and looked out and saw several familiar and smiling faces in the crowd. 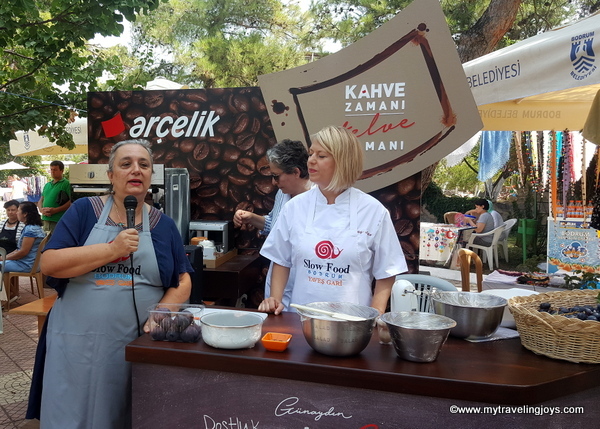 Asli of Cooking Classes Bodrum introduced me at the event. I personally met Ali Öztürk of Karaova-Der and humbly received a lovely award from him. At the end of my presentation, I gave out samples of my delicious fig and grape tart and spoke with some of the audience members. Again, it was an honor to be at the Karaova Festival and talk about baking. 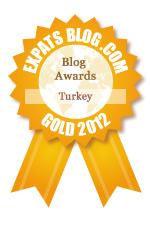 I’m so thankful to have met all these wonderful Turkish bloggers and for providing me with some of these photos. I’m already hoping that I can make another trip to Turkey in 2018! And don’t miss next year’s Karaova Festival in Bodrum! · * Akustik Turizm for providing transportation. · *Hotel Marma Beach for providing lodging. Endorsing what Annie said - what a wonderful posting! Not a post to read on an empty stomach! Food is such a wonderful non-political, non-religious subject to celebrate! Now that I live in France I enjoy the many types of food festivals every year. Even in our tiny village of 600 people we have a yearly soup contest! 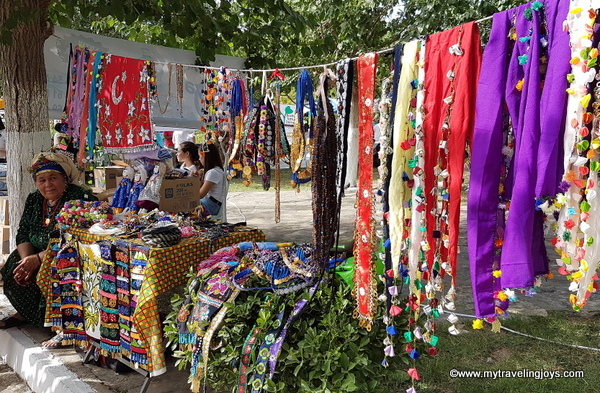 I visited Turkey as a tourist a few years ago and loved the market in Fethiye and the pancakes!